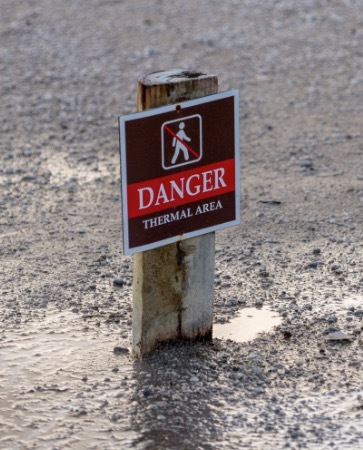 A warning sign in a geothermal area. The development of policy to guide use of the resource. Monitoring and research to measure the state of the resource. The geothermal systems have been classified into management groups which reflect their unique values and current uses. The classification process is set out in the Regional Policy Statement. The purpose of the classification is to manage our geothermal resource sustainably by establishing different management purposes for different systems e.g. the extractive use of the resource is confined to some geothermal systems, while other systems are protected for their intrinsic values. The challenge is to protect intrinsic and traditional cultural values while providing for the use of the energy resource. Council does this by taking a region-wide approach, providing for different values at a regional level rather than trying to provide for all values within each system. The Regional Policy Statement sets the overall direction for geothermal management through objectives and policies. It classifies geothermal systems and requires the development of system mangement plans for some systems. The relationship of Māori and their culture and traditions related to geothermal resources must also be recognised and provided for. Regional plans give effect to the Regional Policy Statement and set the rules for use of the resource. Geothermal provisions are currently in the Regional Natural Resources Plan and the Rotorua Geothermal Regional Plan (please see links below). They include rules on activities, allocation of limits, and things that must be considered in resource consent applications. For example, resource consent is required to construct a new geothermal well or to take geothermal fluid or energy from any geothermal system. Decisions must consider the effects of that use on the system and other users, and on geothermal surface features. These are currently under review. Because geothermal surface features are so fragile, land use around surface features is carefully managed by Council and also by the relevant district or city councils. Along with potential damage to surface features, any work near surface features will also need to consider issues like health (some natural gases can be harmful at high levels) and site stability. Geothermal sites are dynamic and can change very quickly. If you wish to undertake any activity, such as building works, vegetation clearance or earthworks near a surface feature, you may require resource consent from Council or your district or city council under their district plan. There are three types of geothermal wells that are used in Rotorua, including production and injection wells, and down-hole heat exchangers. Any geothermal well can create health and safety risks. Building geothermal wells to best practice standards and keeping them in good condition keeps people safe. To find out more about your responsibilities for managing your geothermal well, and how to keep your well safe, read the Keeping your geothermal well fit for purpose and safe fact sheet.